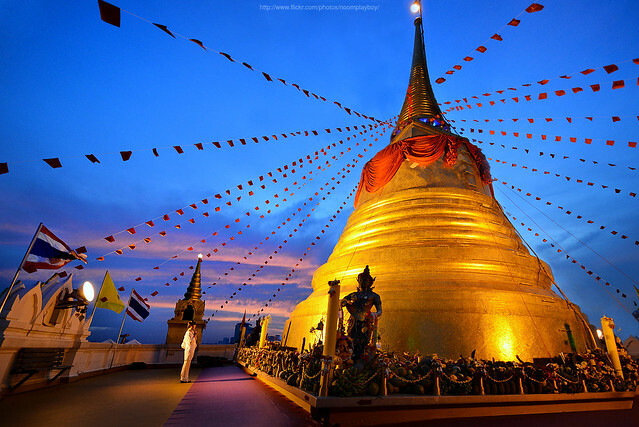 Why The Golden Mount (Wat Saket) is special ? Wat Saket itself (the temple complex at the bottom of the hill) dates back to the Ayutthaya era, when it was called Wat Sakae. The wat was restored under Rama I (1782-1809). Wat Saket was used for cremation ceremonies, which were not permitted inside the walled city. During a plague in the reign of King Rama II (1809-24), 30,000 bodies were brought here. The Golden Mount is an artificial hill constructed under King Rama III (1824-51). When the king tried to build a chedi here before the hill existed, it collapsed because of the soft soil beneath. He therefore made a strong pile of mud and bricks to support it. It was Rama IV (1804-68) who crowned the new hill with the intended chedi. He also shored up the hill with 1,000 teak logs because it was already sinking into the swampy ground. Rama V (1853-1910) added the chedi that stands today, enshrining within it a relic of the Buddha, said to be from India or Nepal, given to him by the British. The concrete walls were added during World War II to prevent the hill from eroding and the structure collapsing. What to explore at The Golden Mount (Wat Saket)? Wat Saket is not generally considered a notable temple in its own right, and most visitors come for the Golden Mount. However, it is interesting for its long history and its use as a cremation and burial site for so many people. Just north of Wat Saket is where you can catch canal boats back to the town center, Siam or further up Sukhumvit. How to get to The Golden Mount (Wat Saket)? SkyTrain to Ratchathewi Station (N1) (Sukhumvit Line). Take Exit 1 and upon exiting turn around and walk straight ahead 200 m. to Khlong Saen Seab. Catch Long tail boat from pier directly to Phan Fha Pier at Wat Saket. Or from the Grand Palace or Wat Suthat, take public transport to cornor of Maha Chai and Ratchadamnern Klang Rd. Beautiful climb up, breathtaking views! Best view of Bangkok...on a clear day you can see forever! Wat Saket is located on the top of a mountain and requires a great deal of walking up lots of steps. It's 318 steps to get to the top so you need to wear comfortable shoes and appropriate clothing. Be ware of any tuk-tuk drivers who tell you the Mount is closed for a holiday; they just want to take you to their brother's gem shop! If you take a taxi, be sure to tell the driver 'Wat Saket' instead of Temple Mount. Costs 20 Baht per person and is well worth it. A nice walk up to the top...... the steps are small and easy to deal with. The top has a super view and photo opportunities. to avoid very hot temperatures , best visit early in the morning or at noon around 4 pm ( but don't be too late it closed around 5 pm).you have to climb many stairs., but don't worry you can stop , take a breath, whenever you want, and enjoy the view. Along the stairs there are many bells small and big. Ring it and enjoy.once you reach highest point, you can view bangkok skyline, beautiful. The Wat itself have a gold stupa, that why it called golden mount. IIts worthed to climb, no regret.